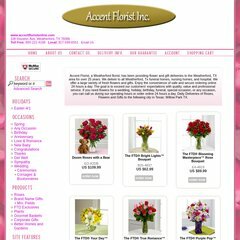 www.Accentfloristonline.com - Accent Florist Inc. Topics: Upcoming Holidays, Occasions, Winter, Any Occasion, and Birthday. It is hosted by United Online Inc (California, Woodland,) using Apache web server. Its local IP address is 216.225.30.84. It has 3 DNS records, authns3.ftd.com, authns2.ftd.com, and authns1.ftd.com.